Evidence that the Matrix Game Construction Kit can be used to win an office holiday party door decorating competition – yet another way to deploy this amazing product! PAXsims is pleased to offer some recent items on conflict simulation and serious (and not-so-serious) gaming that may be of interest to our readers. Whatever holidays you might celebrate, our best wishes from all of us to all of you! The Games for Change Festival 2018 will be held in New York on 28-30 June 2018. We are now accepting submissions for our 2018 G4C Festival. We welcome your ideas for sessions (talks, panels, workshops and demos) and game nominations for our annual G4C Awards. A limited number of submissions will be selected and receive complimentary passes to the Festival. The Festival is a platform for all voices and backgrounds, and provides an opportunity to celebrate and reinforce G4C’s core values: diverse perspectives, creative and progressive thinking, respectful dialogue, and collaboration across industries and sectors. As such, our team of Festival curators will strive to highlight the work and achievements from underrepresented communities. As we celebrate 15 years of Games for Change, we are not only reflecting on the amazing growth of the sector, but also exploring where the G4C community is headed over the next 15 years. What will be the pressing issues of the day? How will technology change the face of games? Who will have access to those technologies? How will these experiences create social change? Please propose session ideas that celebrate the past and explore the future for the games for change community! Have an idea for a talk that doesn’t fit in one of these tracks? Don’t worry — presentations, discussions, demos and challenging ideas outside of these topics are welcome too! In Calgary, and want to learn more about AFTERSHOCK: A Humanitarian Crisis Game? I’ll be discussing the game design and running a session at the University of Calgary on 6 February 2018, as part of their International Development Week. During the Winter 2018 term, ICONS Director Devin Ellis will be teaching an online class on wargaming. The course is offered through the Office of Extended Studies and is available to be taken by students and professionals alike. Please visit the OES website to find out how you (or perhaps one of your students!) can register for the class. Reminder: the UK Defence Science and Technology Laboratory is looking to hire three new wargamers, with applications due January 14. Also, if you saw the Dstl tweet announcing this, you might recognize the game being played—it’s the Reckoning of Vultures scenario from the Matrix Game Construction Kit (MaGCK). Last month we published an extensive report by Ben Moores on the design and play of his megagame on the Iran-Iraq war, Undeniable Victory. Now you can also hear him discuss it on the Last Turn Madness podcast. On this episode Ben Moores discusses his recent megagame, “Undeniable Victory”, with Greg and the gang. He offers interesting insights into the design process, as well as reflection upon what worked well and what needs improvement, and how his design philosophy fits into the wider megagame ecosystem. You are the Section Commander of C/S 11A, an infanty section within a battle group deployed to Takistan. Your section is conducting a dismounted patrol to clear enemy within your Tactical Area of Responsibility (TAOR). A Reconnaissance Patrol has sighted an enemy Vehicle Check Point on a Main Supply Route within your TAOR. The time now is 0800…. You’ll find the full QDE here. Such exercises are included in most copies of the remarkably practical Australian Army publication Smart Soldier. Ezra Sidran has launched a Kickstarter to support development of his digital wargame, General Staff. The General Staff Wargame is a computer wargame designed to simulate any land battle from the 17th, 18th or 19th century using the TIGER/MATE AI system (papers describing the underlying principles and algorithms of this AI can be downloaded here and here). Later versions of General Staff will cover the ‘Ancients’ and ‘Modern’ periods. The General Staff Wargaming System is an easy to use wargame construction set. It consists of a suite of modules for creating armies, maps and scenarios. The 30 most popular (as voted by our fans) battles are included free for Kickstarter backers. In the better-late-than-never category, we (belatedly) bring to your attention Illustrating a Model-Game-Model Paradigm for Using Human Wargames in Analysis, a working paper authored by Paul Davis for RAND back in February 2017. This paper proposes and illustrates an analysis-centric paradigm (model-game-model or what might be better called model-exercise-model in some cases) for relating human wargaming to modeling and analysis. It is especially useful when considerable prior knowledge has already been captured in a model but the model may not adequately address the breadth and richness of issues and options that actual decisionmakers need to consider. Other paradigms are more useful when, for example, no good model exists initially, when the premium is on finding fresh boundary-bursting ideas, or when it is crucial to involve stakeholders in model development from the outset. The model-game-model paradigm was illustrated in an application to crisis planning on the Korean peninsula. It included development of an initial theory-based model, design of a war game to explore qualitative matters (e.g., options, criteria for evaluation, and uncertainty), and execution of such a game in Seoul, South Korea. The game confirmed many aspects of the model but revealed shortcomings that led to model enrichment with additional options and considerations. All of this illustrated successfully one cycle of the model-game-model process. Further cycles are planned. Montréal is well-known for constant road repairs and construction—and frequent corruption in the construction sector. That led a couple of gamers to design a game called—what else—Construction & Corruption. 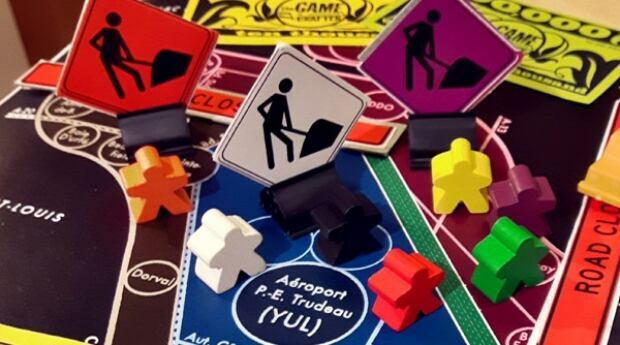 Getting stuck in traffic on Highway 40 proved inspiring for two Montrealers who created a board game poking fun at the city’s well-known ailments, called Construction & Corruption. The game was designed by multimedia editor David Loach and co-creator Frank Perrin. “The game features a lot of negotiation. Bribes and promises are frequent, but never binding,” Loach said. The board is a map of Montreal with zones shaded different colours and highways crossing the map. Players get contracts and can decide where to put work crews. They can also vote for a mayor who, in turn, can reward or punish the players. Work is delayed to earn more money and the game ends with a federal investigation. Whoever has the most money at that point wins. Loach said that every time someone double-crosses another player, the game gets more hilarious. “Test players comment that they feel dirty when they play it. You end up collaborating with some people and then turning your back on them,” he said. The Montreal Gazette also has a report. You’ll find their KickStarter for the game here. As a Montreal resident, I’m a backer! For a more serious examination of gaming corruption, see my July 2017 presentation to Dstl on the subject.